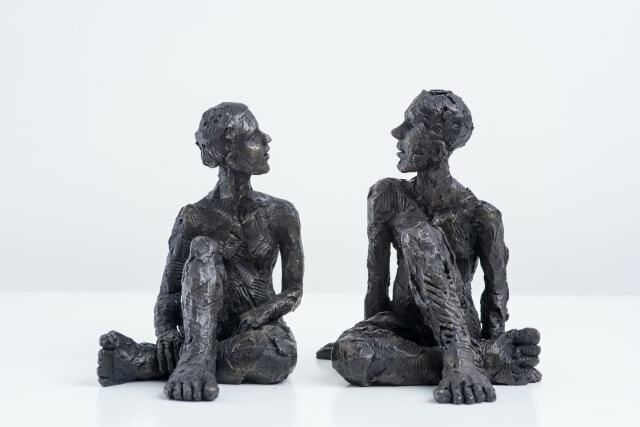 Carol Peace is inspired by everyday human interaction using the figure as a conduit for exploring themes of relationships, friendships and just being solitary. A figure's hands and feet may be proportionally enlarged, giving the impression of a mythical, partly imagined but expressive human being, grounded, connected and strong. Her people are often quietly reading, standing or gazing skywards, sitting atop rock-like plinths; couples sitting closely together or solitary figures looking benignly on. Carol Peace's work is strongly influenced by her life drawing, before becoming a full time sculptor she spent a year drawing at The Royal Drawing School (Formerly The Prince's Drawing School) studying the figure. This practice of observing the figure is the foundation of her sculptural work, in which her figures are balanced, they have a poise and an incredibly touching physicality. She maintains her drawing practice to this day, her distinctive technique in mark-making, expressive and yet light of touch can be clearly seen in the sculptures which are expressive and textural, like she is drawing with the clay. Rather than making a sculpture directly from what she is drawing, drawing for Carol is the best way of heightening her sense of observation and finding the form for her sculpture. She feels that if her drawing is neglected, she would lose that sense of power and visual language acquired by observation. Carol Peace graduated in Sculpture from Winchester School of Art, and then completed The Drawing Year at The Royal Drawing School in London (Formerly the Prince's Drawing School) She then co-founded The Bristol Drawing School in 2007. She became a patron of the Royal West of England Academy in 2011.